Tony Stewart? Former open wheel driver who switched to NASCAR and then won 46 races and 3 championships in NASCAR? When did any NASCAR driver had such success in the open wheel racing? They havent because no one wants to convert from nascar to open wheels, its the other way around, go to youtube and type in jeff gordon drives an f-1 car and listen to the announcer! I guess you guys didn't see the event from Watkins Glen, where Lewis Hamilton and Tony Stewart swapped cars? Once they got the seat adjusted so Lewis could see out of Tony's car - - he BEAT Tony's lap time in Tony's car on Tony's favorite track! I thought it was absolutely hilarious that the Nascar drivers were complaining about having to juggle 5 radio channels, while F1 drivers make over 100 steering wheel inputs EVERY LAP, while doing a heckuvalot more than just turning left! Compare the steering wheel of an F1 car with that from a Nascar sometime. F1 drivers Rule! Moonshiners drool! Last edited by cdynaco; 5/22/12 at 06:15 PM. Where you gettin 5 seconds from? Clearly we didnt see the same video! Jeff Gordon's best time that day was 1:16. Montoya's was 1:11. Senna was a much better driver than Schumacher. as for the comment about teams hiring Fellows and Said, etc and still beating them...you do realize that it's the lower tier teams hiring those guys, right? They don't have the cars on the same level as the big teams, yet those guys are still very competitive. That same weekend, Montoya qualified for the 2003 the USA Grand Prix at 1:11.948. 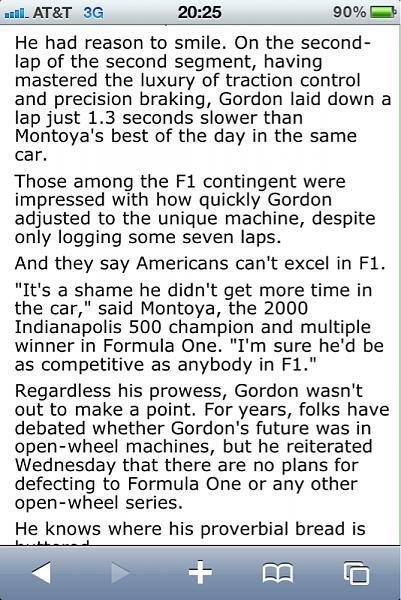 If Gordon was that good, he would be driving F1, not NASCAR. F1 is much more popular world-wide and he could be making much higher salary at F1 than NASCAR. NASCAR (as well as Indy) is for drivers who can't succeed in F1. I wouldn't drive F1. I love it but it's for douchebags. NASCAR (as well as Indy) is for drivers who can't succeed in F1 or GP2. My, oh, my. I thought my Original Post might draw some controversy, but nothing like this! Give me a break, guys. There are stock car fans (me) and there are open wheel fans (not me...and I track my GT around a road course, not the drag strip or ovals). Both are spectacular sports with great TV coverage. Like what you like, stop comparing 'mine is better than yours'...really? I love NASCAR because no where else can you see awesome in-depth coverage of 40+ stock cars, with 800+hp each, running three-wide at near-200mph, and hear that thunder. Like what you like. Last edited by PJRManagement; 5/22/12 at 10:03 PM. What's exactly "stock" about them? OK, more for Zoran, then. I got to see Long Beach in the late 70's and it sounded like a swarm of angry bees chasing through the city. IIRC, Monaco is this weekend. With that and the Brickyard, DVR's gonna be busy. Last edited by cdynaco; 5/22/12 at 11:36 PM.